The way you sleep can make a huge impact on both your body and mind, so choosing the best sleeping position is of the utmost importance. It’s a lot to keep track of, this whole sleeping thing—you have to sleep for exactly 8 hours (Or 7, or 6, depending on who you ask. ), at the right time of night, with the wind blowing in the right direction, and now you have to think about how you’re doing it. Before you get too worried over how you’re sleeping, we’ve got some tips on finding healthy sleeping positions. Consider this your ultimate sleep position guide! There are a lot of conditions that can be worsened or lessened depending on how you sleep—lower back pain, digestion issues, nerve pain, and pregnancy can all be more comfortable if you find the right way to sleep. Best Sleeping Position For Neck Pain Neck pain can come from a variety of sources, from the wrong pillow to medical maladies that require a doctor’s visit. If you find that you’re waking up with neck pain, you may want to try changing the way you sleep and see if that’s the culprit! Sleeping on your side or on your back puts the least pressure on your neck, whereas sleeping on your stomach forces your neck to twist at an angle that can lead to pain. A softer pillow that conforms to you, such as feathers or foam, can help give you the support you need without angling your neck too severely. Avoid super thick pillows that are too high and create too much curvature in your spine. If you sleep on your side, using a pillow that gives you just enough lift to keep everything aligned should have you waking up refreshed, and not stiff. Best Sleeping Position For Back Pain Depending on where you’re feeling pain, changing up your sleeping position may be able to alleviate some pressure on your spine. Keeping your spine neutral is the key to getting a great night’s sleep, and you can achieve that perfect alignment in a few positions. The best sleeping position for lower back pain is likely on your side, without curling yourself up too much or staying so stiff that you arch your back in the process. A small pillow will help cradle your neck and keep your spine as neutral as possible. If you find that sleeping on your side creates some pain on your knees, you can always add a little pillow between your legs to get even comfier. If side-sleeping isn’t your gig, there are a few other sleeping positions for lower back pain to try! Sleeping on your back, with a small pillow behind your neck and head, but not propping up your shoulders, can help prevent pain. This keeps you well-aligned, without adding pressure anywhere, however, it may not be the most comfortable position if you snore or are pregnant. The only thing to watch is that you don’t arch your lower back too much, as this leads to pain. Adding a small pillow if needed can relieve that pressure. The best sleeping position for back pain, in general, is on your side, with a totally neutral spine. If you find that you’re experiencing upper back pain in your shoulders, check that your pillow isn’t too high and causing your spine to fall out of alignment. Always check with a doctor if your pain lasts—they know best! Best Sleeping Position For Hip Pain Hip pain, whether from an injury or general pain, can certainly hinder your sleep. If only one hip hurts, favoring the other side as you sleep will help keep pressure from worsening it. Sleeping on your side with your knee drawn upwards can help create the perfect sleeping position for you. A pillow under your knee to rest on can also make you more comfortable. If sleeping this way makes you feel like your neck is strained, experimenting with the height of your pillow may help. If you aren’t able to get totally comfortable this way, or both of your hips hurt, updating to a softer mattress or adding a rolled blanket or pillow under the small of your back and adjusting to relieve pressure can help you wake up feeling much better. Icing your hip before bed can also lead to better rest, as can alternating how you sleep so that you aren’t constantly applying pressure to the same joints. Something as simple as adding a bit of extra bedding under your hip joints can work wonders! Best Sleeping Position For Sciatica Sciatic nerve pain can cause you to lose hours of sleep. If you think you may have sciatica definitely contact your doctor to get a professional diagnosis and the proper care regimen in action. No two people are exactly the same, so what works for one person may not work for you, as there’s no perfect position for sciatica. Sleeping with sciatica might be easier if you elevate your legs while sleeping on your back. Lifting your knees towards your chest and placing a supportive pillow under your legs will help moderate pressure. Sleeping on your side with a body pillow between your legs can also help keep your spine aligned and avoid irritating your sciatica. If you struggle with staying put at night but want to stay off of a certain side, you might find that sneaking a tennis ball into the pocket of your sensitive side will keep you from favoring it while you sleep. The discomfort will encourage you to stay off that side and, hopefully, prevent further irritation. Sleeping on your stomach is typically not a great idea, but especially when dealing with nerve pain. The forced curvature of your spine can irritate the condition. The Best Sleeping Positions For Digestion If you suffer from heartburn or acid reflux, the way you sleep can have a huge impact on your ability to digest properly. Recent studies have shown that sleeping on your left side can help prevent heartburn and aide in better digestion. 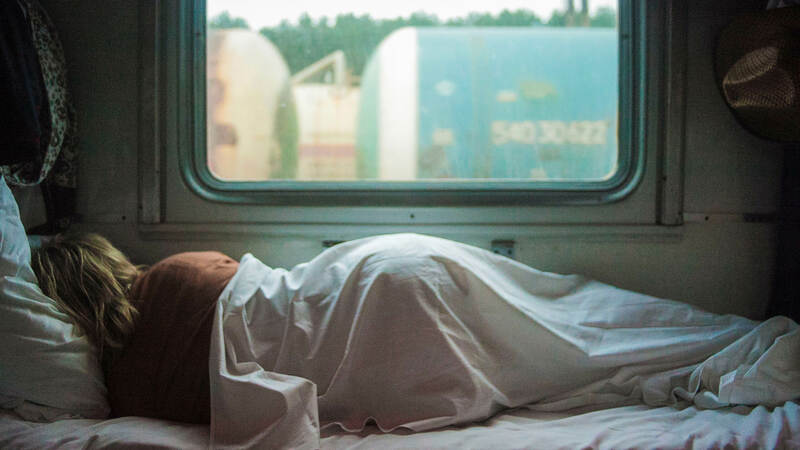 Sleeping on your right can actually increase the risk of heartburn, so if you’re worried about rolling over a wedge or body pillow can help keep you on your left side all night long. Many sleepers find that elevating their head 6-9 inches with a wedge pillow drastically decreases heartburn at night. Because of the elevation, stomach acid doesn’t inch up into your chest or esophagus, helping you get a solid night’s sleep without any digestion disruption. The Best Sleeping Position During Pregnancy It can feel pretty ironic—the time you need rest the most and you can’t get comfy enough to actually sleep. There are a few ways you can hit the hay that will help you get the sleep you need. The best sleeping positions while pregnant are going to be mostly on your side. Sleeping on your back is obviously tough on your spine and a quick road to back pain, but staying on your side will help keep you aligned. Adding a pillow under your baby-bump can give you extra support and make you much more comfortable. Sleeping on your left side may even help improve blood flow to your baby while you sleep, as well as prevent heartburn, which is especially helpful in later trimesters. There are a ton of special pillows available that are designed just for pregnant women to ensure a comfortable night, like this one here. The Best Sleeping Positions To Stop Snoring If you’re looking to stop snoring, or perhaps educate a partner on how they can stop snoring, roll on over to your side. (Or, of course, gently roll your partner over.) Sleeping on your back can restrict your airways and lead to snoring loud and proud, which isn’t always ideal. Sleeping on your stomach can be problematic in other ways, but it has been shown to reduce snoring. Armed with this sleeping position guide, you should know what is the best sleeping position for your individual needs! Tuft & Needle gives no professional medical advice as everyone is unique, and always recommends speaking with a liscenced physician for any medical needs.